As our countdown to Avengers Infinity War continues, I thought I’d throw out another Avengers related read pile entry to keep those fires stoked! Typically, when I do these read pile entries, I like to review some sort of obscure or older book that many may not have read and therefore give them a mouthful of food for thought as to whether its worth picking up. This entry is nothing like that as I review not only a newer book but one that has been pretty much universally acclaimed as one of the best books of 2012. Yep, I’m talking about the Hawkeye series written by Matt Fraction. Google search this series and you’ll most likely find enough glowing gushing reviews to fill a small oil tanker. Yes, so many good things have been said about this book that it would make even the Pope blush at the outpouring of support. Not to say that any of that praise is not richly deserved. To the contrary, after being given this book by my buddy, Chad, I sat down and quickly devoured it like some sort of mint chocolate left on my hotel pillow. It was fresh, witty, and utterly charming, pretty much what everyone else has said about it. But as a blog writer, that realization left a bad taste in my mouth. Why you ask? It’s because if really the book is everything everyone else says it is, why the hell would you read my blog just to hear me say the same damn things? I mean if you wanted that kind of review you could just dial up Comic Book Resources website and read a professional’s take on how knickerbocking great it was. No, no. My pittling little blog can not compete with such legitimate gobbledgook. Therefore, I had to rethink this entire idea of a review of this book into something completely different. Something that fits into my little niche in the blogosphere. 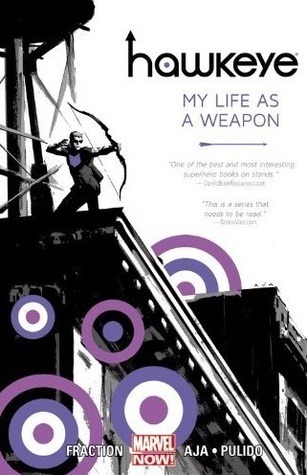 Therefore, instead of writing a flat out review of this book, I thought I’d do more of a review of the character that is Hawkeye, and why in my opinion it’s so easy to actually write great stories about him. 2) He’s the only essential Avenger with absolutely no super powers. So right off the bat, we get an instantly relatable character because he’s both flawed and human. And we are nothing as readers if not entirely flawed and completely human. It’s a special kind of flawed too. It’s someone that does some morally questionable things, like in Avengers Annual #16 “The Day Death Died”, when only he and Captain America survive the death of all the Avengers at the hands of the Grandmaster, he cheats like hustler with Three card Monte to finally defeat the powerful Eternal. He does selfish things like quitting the Avengers time and time again in Avengers #109, #144, Avengers vol. 3 #9, and both West Coast #45 and #100. Particularly selfish in the West Coast Avengers book given that he actually founded the damn group. And most of the times he quits its for lame Emo “My friends don’t cut the crust off my sandwiches so they don’t understand me” reasons. Ok…so maybe I made that up, but it’s usually some pretarded inferiority complex thing. He’s also incredibly selfish with the women in life such as the way he’s treated both Mockingbird and Spider Woman: cheating on them, dumping them, not giving back their Weezer collection of CDs afterwards. Although, in his defense, he has been on the receiving end of some harsh treatment by the ladies such as constant rejection by Black Widow (in my opinion the classic Marvel example of a girl that’s just not into you), and oh yeah, he was flat out murdered by Scarlet Witch. Still though, despite that shabby treatment, a real hero should rise above all that and be the bigger guy. And yet despite all that Hawkeye strives to make good for those bad things by doing extraordinarily selfless things. The most recent example of this was risking his life big time just to flush out a mole within the Shield organization in “The Tape” storyline presented in this blogs title book. Plus as I stated before, the dude was a stone cold baddie for at least one story at the beginning of this fictional life, and yet put that mess behind him and joined the premier superhero team in the universe…at a time when most of the core members jumped ship to boot. America loves the notion of second chances and people making amends for bad stuff. The likable Han Solo rogue that makes a face turn at the last second and saves the day. We’re hardwired to root for those people, and Hawkeye is no exception. We’re also hardwired to root for underdogs, and let’s face it as the only shmuck that couldn’t bench press a car in that select few that fans would consider in the “Top 8 Avenger team must haves”, Hawkeye is more underdog than Lovable Shoe shine boy. Yep, old Hawks got one thing and one thing only that keeps him from biting it every time Thor says “Screw Thou, Kang! Partake of a slice my Uru Hammer…in thouest face!” That one thing is skill. 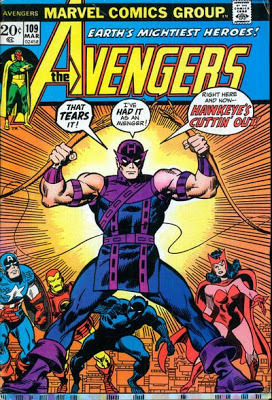 In fact, Clint Barton sums it up the best in Avengers 174 when he beats the tar out of another Eternal in the Collector: “When it comes to the Avengers, there is power and there is skill – many are ahead of him in the former, but he’s second to none in the latter”. That self confidence, steely nerves, and acceptance that he’s willing to work with the tools he has, again endears him to readers all over who can relate to sometimes not being the fastest horse in the race, but still determined to make the finish line. 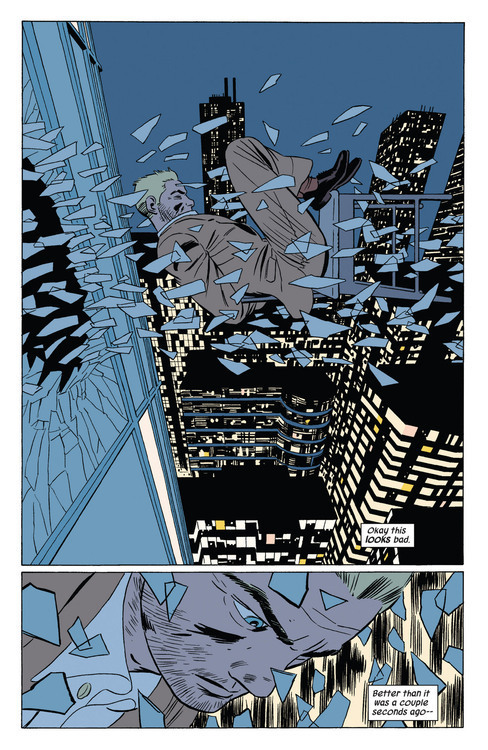 Yes, there’s no question that Matt Fraction understands these facets of what makes Hawkeye a great character and weaves them throughout his book, just as a well as I point them out here. That’s why the book is good. It’s not some magical formula or once in a blue moon pairing of writer and character. It’s just someone being real about what makes someone a hero and writing quality stories about them. I’m definitely interested in seeing where the series goes from here, but so long as Matt continues to hit these touchstones about good old Purple boots, I don’t think it’s ever going to be a bad thing. Thanks, Sunny! Always nice to hear kudos from you, buddy!